Warmth is the best medicine. Many years, ago, people realised that targeting heat onto your back has a soothing, relaxing and analgesic effect. With InfraPLUS, infrared-C radiation generates radiant energy to warm your back more intensely. 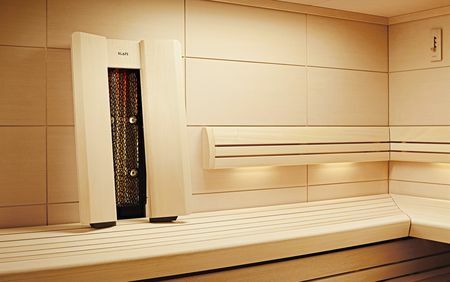 Not only is InfraPLUS a wonderful addition to your sauna and SANARIUM®, it’s also a very meaningful one – because it means you no longer need to install a separate infrared heat cabin. 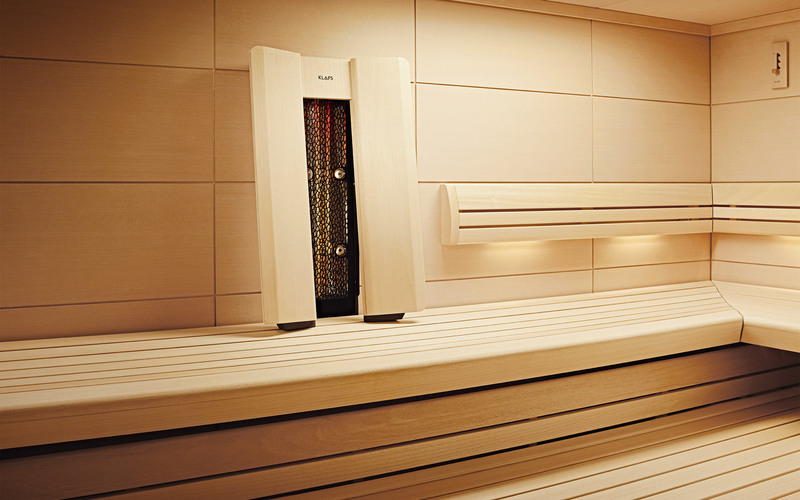 KLAFS is the first company ever to integrate SensoCare infrared heat technology by Physiotherm into a sauna. To ensure you sit comfortably even on particularly low sauna benches, the backrest can be adjusted forwards into a number of positions. 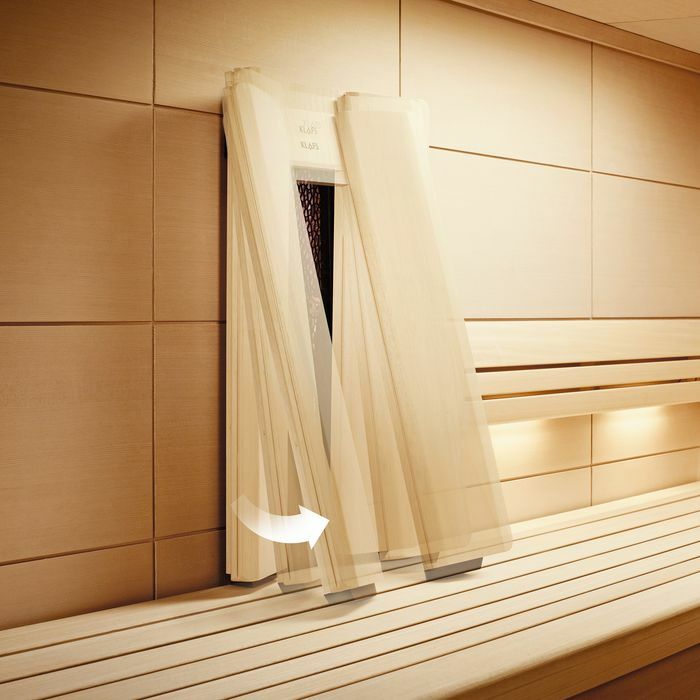 So you can always make yourself comfortable – whether you’re enjoying an infrared session or a sauna. 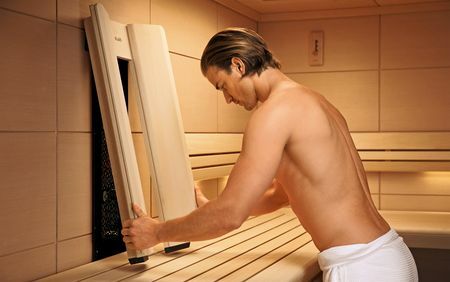 In order for the infrared source to unfold its full soothing effect without overstressing your skin, four SensoCare sensors inside the infrared heater measure the temperature of your skin remotely during the entire course of the session and adjust the intensity of the radiation accordingly – very gently and completely automatically. Choose from three settings: soft, medium or intensive. As soon as you lean back, the session begins. Thanks to the sauna heater, you can heat up the cabin rapidly to a cosy 27°-35°C whenever you fancy a quick infrared session. Which promptly won the world’s most prestigious innovation award for technology, sport and lifestyle, the Plus X Award. 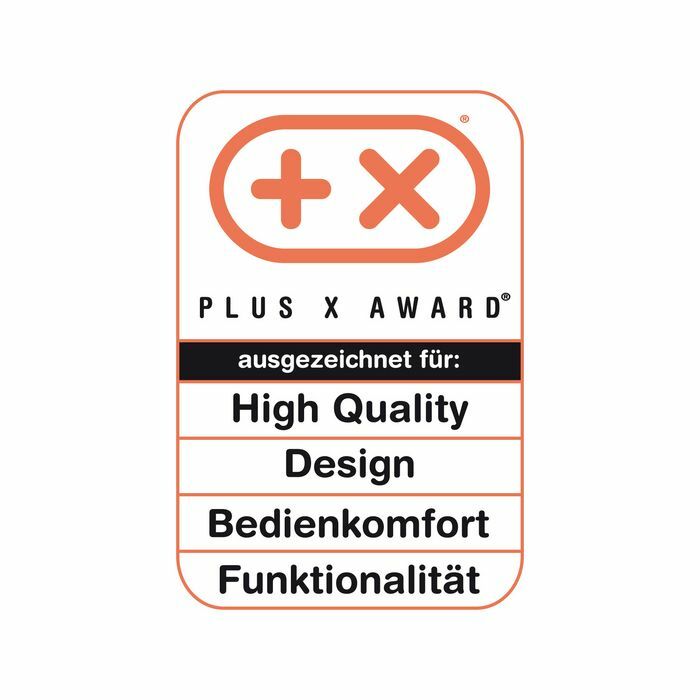 The optional InfraPLUS extra for saunas scored points in the following categories: high quality, design, ease of use and functionality. With InfraPLUS, infrared-C radiation warms your back intensively. Backrest can be adjusted to various levels. 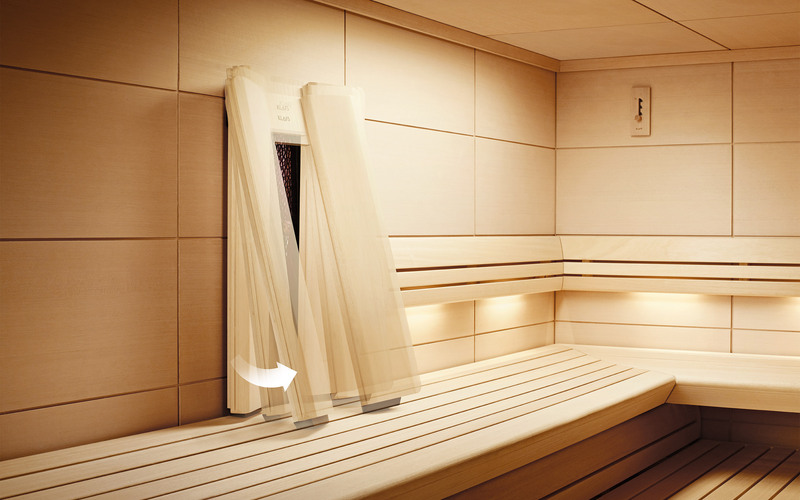 Complies with RAL guidelines for infrared heat cabins. Life-long guarantee for the patented low-temperature ceramic heater. RAL certification protects consumer interests in a wide range of areas. Nowadays, choosing the right product or service can be a tricky business. There’s almost too much choice – both from home and abroad. And it isn’t always easy to distinguish poor quality from good quality. RAL certification is a very useful guide here, protecting consumers from making costly mistakes. If a product is RAL certified, consumers can expect qualified support, quality features & fittings, high safety standards, environmental awareness, and user-friendly and efficient products. The RAL is an independent institution which develops RAL certification guidelines. The RAL Quality Assurance Board is responsible for awarding certification. Quality-conscious service providers and manufacturers have joined forces in these recognised RAL Quality Assurance Boards. Only companies which voluntarily subject themselves to the strict RAL guidelines and test requirements are entitled to call their products RAL-certified. Regular internal and external controls are conducted to ensure companies continue to comply with the regulations. Currently, there are more than 160 RAL quality labels for thousands of products and services. These are awarded by more than 130 RAL Quality Assurance Boards with over 9000 member companies from all industries in Germany and other countries.